9 − = 8 Required Please enter the correct value. Crude oil prices today (Wednesday, June 22) fell below the $50 mark ahead of the big Brexit vote tomorrow. 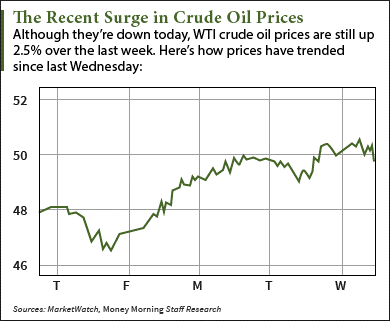 At 10:35 a.m., WTI crude oil prices were down 0.2% and trading at $49.73. After rising above $50 a barrel earlier in the morning, futures for August delivery tumbled back below $50 after the EIA reported a lackluster supply drop. The agency said U.S. supply fell by 900,000 barrels last week, missing analyst estimates of a 1.4 million barrel decline. Brent crude oil prices also posted losses this morning. The global benchmark dropped 0.5% to $51 a barrel. Futures for September delivery have still gained 3% over the last week. Tomorrow, British citizens will vote on whether or not the United Kingdom should leave the European Union. Brexit supporters argue leaving the EU would allow the UK to make its own immigration laws, which have been debated in recent years due to the ongoing migrant crisis. Meanwhile, Brexit opponents say leaving the EU would have a devastating effect on the British economy due to its reliance on trade with other members. With 45% of all British exports currently going to the other 27 EU nations, this strong source of export revenue could disappear if the UK sours its relationship with the bloc. The recent polls have been leaning toward staying. According to research from the "What UK Thinks" organization, the average of the last six British polls show 51% are in favor of remaining while 49% are in favor of leaving. But Money Morning Global Energy Strategist Dr. Kent Moors says these opinion surveys are often inaccurate. That's because they don't account for the undecided voters who typically end up following the status quo. If UK citizens do vote in favor of a Brexit tomorrow, both Brent and WTI crude oil prices will move lower in the short term. You see, a Brexit would be bad for oil prices because it means European currencies like the pound and euro decline in value. This currency crash would boost investing interest in the U.S. dollar, which typically serves as a safe haven when other currencies fall. Since overseas investors will pour money into the dollar as their currencies drop, the dollar will rise in value. That's a bearish thing for oil prices since a rising dollar makes dollar-denominated commodities like oil more expensive to users of other currencies. "As the value of the pound, Swiss franc, and euro fall against the greenback, it costs more for Europe to purchase oil since it requires more of their currency to 'buy' the dollars necessary for the transaction," Moors – a 40-year veteran of the oil market who's worked with high-level energy agencies in the United States and Russia – said on June 15. Although oil prices would become volatile, a Brexit would have the opposite effect on the U.S. stock market. In fact, U.S. markets would become a safe haven as European markets enter a period of instability due to the Brexit's negative effect on trade and the EU economy. The Bottom Line: Crude oil prices have rallied over the last week as increasing anti-Brexit sentiment reduces the bullish outlook on the U.S. dollar. But investors should be prepared for some oil price volatility if Britain decides to leave the EU. A Brexit will lower prices due to the falling values of European currencies, but it will make the overall U.S. market look attractive to global investors.